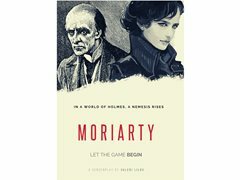 Moriarty - a modern female Sherlock Holmes adaptation retold from the greatest archenemy: James Moriarty. The web-series will be 8 episodes x 15-20 minutes each. Shooting will be in June (two seasons back to back). Charlie Chan is a fictional character created by Earl Derr Biggers. Biggers loosely based Chan on Honolulu, Hawaii detective Chang Apana. The benevolent and heroic Chan was conceived of as an alternative to Yellow Peril stereotypes and villains like Fu Manchu. Chan is a detective for the Honolulu police, though many stories feature Chan traveling the world as he investigates mysteries and solves crimes. Takuma Tsurugi (also referred as "Terry" Tsurugi in the U.S. dubbed version) is an amoral anti-hero in The Street Fighter film trilogy, played by Japanese actor Sonny Chiba. He is a martial arts expert and a mercenary for hire. As opposed to the many heroic protagonists portrayed in the chopsocky boom of the 1970s, Tsurugi is an amoral antihero who is not above committing wicked deeds in exchange for monetary rewards, although he possesses a strong sense of justice nonetheless. Modernized version ofg the King Arthur character. Mowgli, fictional character, an Indian boy raised by wolves who is the central figure in Rudyard Kipling’s collection of children’s stories included in The Jungle Book (1894) and its sequel (1895). Peter Pan, a boy who will not grow up. He runs away on the day of his birth so that he will not have to become a man. He lives in Neverland, home of the fairies, protected by his friends the Indians against his enemy, Captain Hook. He is attracted to the Darling home by the stories the mother tells her children. He persuades the Darling children to visit Neverland and teaches them to fly. The protagonist of the epic, Beowulf is a Geatish hero who fights the monster Grendel, Grendel’s mother, and a fire-breathing dragon. Beowulf’s boasts and encounters reveal him to be the strongest, ablest warrior around. In his youth, he personifies all of the best values of the heroic culture. In his old age, he proves a wise and effective ruler. Crusoe begins as a young middle-class man in York in search of a career. His vague but recurring feelings of guilt over his disobedience color the first part of the first half of the story and show us how deep Crusoe’s religious fear is. Crusoe is steady and plodding in everything he does, and his perseverance ensures his survival through storms, enslavement, and a twenty-eight-year isolation on a desert island. Long John Silver is a very complex and self-contradictory character. He is cunning and mendacious, hiding his true intentions from Squire Trelawney while posing as the ship’s genial cook. He is very disloyal, shifting sides so frequently that we cannot be sure of his true affiliations. He is greedy and has an almost animal nature, caring little about human relations, as we see in his cold-blooded murder of Tom Redruth. Famed Vampire Hunter from Bram Stoker's novel, Dracula. The Dutch Professor Van Helsing has knowledge in a wide variety fields, and is probably the only person on earth prepared enough to do battle with the likes of Count Dracula. Dr. Thorndyke can be referred to as the first truly scientific detective. Sherlock Holmes demonstrably used scientific method, but with Thorndyke we actually get to know the detail of the experiments carried out, the scientific method, and the flaws where they exist. This is equally true when it comes to cracking cyphers, or reconstructing documents thought to be destroyed. Father Brown is a fictional character created by English novelist G. K. Chesterton, also main character of TV series Father Brown. As the Chinese have been so often represented—and too often misrepresented—in our popular crime literature, it seems only just that they themselves be allowed to have their own say for once in this field. All the more so because this branch of literature was fully developed in China several centuries before Edgar Allan Poe or Sir Arthur Conan Doyle were born. Iago is a sly, intelligent villain because of his powers of manipulation. He convinces people he has an honest reputation; however, he is actually a twisted person who persuades Othello to think Desdemona is having an affair with Cassio, his right hand man. Iago is amused by his revenge and how it affects Othello, he finds the demise of others comical and reaps the benefits of his successful plans. He is both unappealing and appealing to the audience. Despite being on the brink of starvation, Hansel is pretty chill throughout the tale. Every time Gretel cries, he comforts her with something like: "Don't worry, my dear little sister. Just sleep in peace. God will not forsake us". Even when captured by the witch, he's clever enough to stick out "a little bone" instead of his finger, in order to seem like he's not fattening up enough to eat. Wiggins is the most frequent helpmate to Sherlock Holmes besides Doctor Watson himself. He also leads the Baker Street Irregulars, the unofficial cadre of street children that help Holmes on some of the more baffling cases, acting as his eyes, ears and information gathering service. Allan J. Pinkerton was a Scottish-American detective and spy, best known for creating the Pinkerton National Detective Agency. The titular character of the novel, Lady Audley is the wife of both George Talboysand Sir Michael, the daughter of Lieutenant Maldon, the stepmother of Alicia Audley, and the aunt by marriage of Robert Audley. With her blue eyes, rosy cheeks, and bouncing golden curls, she possesses a childlike beauty that she uses to manipulate and deceive those around her. Having grown up in poverty, Lady Audley is extremely concerned with elevating her social and financial status. Quasimodo, or the hunchback of Notre Dame, was born with a hunched back and a wart covering one of his eyes. He is also deaf. As a child he was abandoned but eventually the Archdeacon Claude Frollo adopted him on Quasimodo Sunday (the first Sunday after easter). Frollo names him after the day he was found. As he grows up he becomes hated for his deformities but it is revealed that he has a kind heart.